Dob:19 March 1842, Wellington - died September 1890 Greytown. Luke was the surviving son of James Hobman and Jane Marie Hobman (nee Thomas) of Kent. James and Jane settled in Wellington, New Zealand in 1840 having arrived on the Martha Ridgeway on 8 July 1840. They brought with them their five year old son Matthew, born in 1835 in Kent. Two years after their arrival in Petone, Luke was born in Wellington and sadly at this time, Jane died giving birth. James raised the two boys until his own death, possibly of consumption, in 1846. Matthew was 11 and Luke just four years old. It is believed that both James and Jane were buried at Bolten Street cemetery. Another tragic event occurred in 1846 when the young eleven year old Matthew was murdered at Day's Bay, Lower Hutt. Raised in foster care in Wellington after the death of his father, the orphaned Luke made his own way in the world and as a young man joined the Petone Navals fighting the Maori in the Parihaka expedition of 1860. Perhaps he found the brotherhood he may have craved, with the military remaining an important aspect of Luke's life. He received a military funeral at his untimely death in 1890, when he was just 48 years old. At the conclusion of the New Zealand wars, Luke ventured over the Rimatukas to Wairarapa where he worked as a cobbler, marrying on 14 February 1863 and settling in Greytown, the town of his wife, Ann Maria Hall. Ann Maria was the daughter of John and Elizabeth Hall who had immigrated to New Zealand in 1853 from the UK. This court notice implies the 35 year old Luke had run foul of the law, but we aren't to know exactly what his misdemeanor was. Hannah and Co. v Luke Hobman - In this case it appeared that the summons had not been served, the constable at Featherston writing to say that Hobman was at Blackgate, two day's journey from his (the constable's) station, and as there was no allowance for horse, etc, he could not go. Plantiff said defendant was now in Greytown. Luke appears to have been a prospector, with this report of him finding human remains at Palliser Bay in 1880 and gold and coal prospecting in 1888 in south Wairapapa. However, the province didn't yield profitable amounts of gold or coal and prospecting didn't make the family a fortune, as it did for many in other parts of the country, in the 1860s. A boot and some human bones were found the other day in Palliser Bay by a a man named Luke Hobman. they are supposed to be the remains of a man, one Green, who was drowned in May last. The city coroner deems it unnecessary to hold any inquest. We have not yet received any good results from our gold-bearing ranges, but we are told by those who are supposed to be in the secret "that the good time is coming; only wait a little longer." I fear we will have to wait, although, in common with everyone in this district, I would say, "the sooner the better." Luke suffered a long illness from an early age and most probably died of cancer at the age of 48, in the year that his and Ann Maria's 12th child was born. Ann Maria raised the 12 children alone after Luke's death. Luke was a popular and respected settler in Greytown and received a military funeral complete with brass band. Wairarapa News and Evening Post, Vol XL, Issue 78, 29 September 1890, Page 2. Mr Luke Hobman, of Greytown, who died of Friday night, received a military funeral yesterday, the members of the Greytown and Papawai Rifles attending their comrade to the grave. Deceased was a member of the first cavalry troop in Greytown. He served with the Petone Navals in the Parihaka expedition, and has been since a member of the Greytown Rifles. A large number of the general public also attended the funeral. It is most likely that Luke's funeral was conducted in this Wesleyan church. Built in 1865, this was Greytown's first church, originally built at 63 Main Street by Luke's father-in-law, John Hall and other townsfolk including Mr Hart Udy Snr. 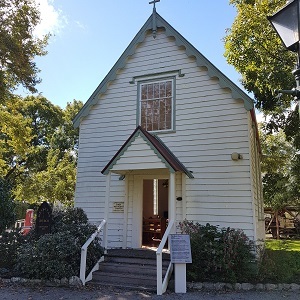 The church is now part of Cobblestones Museum, Greytown. Original generation time 0.9937 seconds. Cache Loaded in: 0.0175 seconds.